Deonte Tatum went by John Wilder during Twilight Ohana earlier this month. 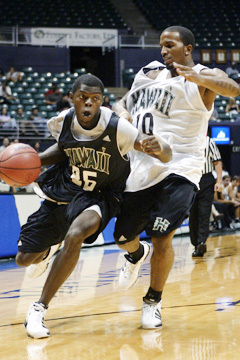 He's been UH's most reliable point guard in scrimmages, but has been practicing at various positions. DEONTE Tatum makes a point of knowing the duties of each of his teammates as well as his own. The senior guard for the Hawaii basketball team is focused on reclaiming the starting job at the point. His experience gives him the early edge over several newcomers at that position. But his familiarity with the system also gives him the versatility to try other spots on the floor as head coach Riley Wallace sorts through his options. "I know all the plays. You have to, if you're going to play point guard. So it's not a big transition," Tatum said. "You have to make sure everybody's in the right spots. If they're not, you have to get them in the right spots. You have to make sure you've got everybody where they need to be." The UH coaches have placed him at shooting guard and small forward in practices. Funny thing is, he's not a bad swingman. "He makes things happen and he shows good leadership," Wallace said. "He's an athlete and plays bigger than you think he does. He's improved his guard play, but somehow, he seems natural at the three-spot." The 6-foot-3 Tatum started 13 of UH's first 15 games at point guard last season, but came off the bench during the second half of the campaign. He averaged 3.4 points and 1.5 assists for the Rainbows after transferring from Indian Hills (Iowa) Community College. He worked on his game back home in Milwaukee over the summer and returned to campus this fall comfortable with the playbook and confident in his abilities entering his second season of Division I ball. "Last year, I was thinking way too much," Tatum said. "This year, it's just go play and go have fun. Do what you know you can do. Don't let nobody tell you you can't do it, don't let nobody say, 'You're not good at this,' because I know what I can do." Although he's been practicing at various positions, Tatum has been the Rainbows' most reliable point guard so far. He scored seven points and dished out nine assists while committing just one turnover in the team's weekly scrimmage last Thursday. He also collected six rebounds and three steals in the 50-minute session. Tatum said it didn't bother him when the coaching staff targeted point guards in their recruiting efforts in the offseason. The Rainbows ended up signing three guards -- junior John Wilder and freshmen Hiram Thompson and Dominic Waters -- to compete at the point. "That's what they needed to do," Tatum said. "I just said, 'They're going to come here and they're going to compete.' "
Wallace has been pleased with Tatum's effort and attitude in practice and has also noted his ability to set hard screens and create open shots for his teammates. "Everything we do is set up by how good a picking team we are," Wallace said. Although he's more familiar with playing in the backcourt, Tatum said playing forward hasn't required that great a leap. "In high school I played post and all through junior college I used to post, too," Tatum said. "If that's what they want me to do, I'll go do that. I enjoy going down there and playing with the big boys." Walking tall: Jared Dillinger, a transfer from Air Force, joins freshman Jack Miller as the walk-ons on the 15-player UH roster. Dillinger played two seasons at Air Force and averaged 2.1 points and 1.3 rebounds for the Falcons last season. He decided to leave the academy in the offseason and enrolled at UH this semester. "I looked at the program and they have good coaches," Dillinger said. "They have a good system and it's kind of like the Air Force offense, so I thought I could fit pretty well here." Dillinger and center Stephen Verwers will practice with the team, but will have to sit out this season as transfers. The duo played against each other last year when Verwers was at Mountain West Conference rival Colorado State. For starters: Michigan State, UH's opening opponent, is ranked fifth in the USA Today/ESPN preseason coaches poll. The Spartans reached the Final Four last season and visit the Stan Sheriff Center on Nov. 19. Tip-off is scheduled for 1:05 p.m. MSU then heads to the EA Sports Maui Invitational, which includes four other ranked teams -- No. 2 Connecticut, No. 7 Gonzaga, No. 9 Arizona and No. 21 Maryland. No. 25 Nevada is the only Western Athletic Conference team in the poll. Conference newcomer Utah State received two points.